A seemingly innocuous question in manager Davey Johnson’s press conference Wednesday following the Washington Nationals 9-4 win over the San Francisco Giants revealed that the skipper of the team with the best record in the National League has prepared for the idea of playing in September without his best pitcher, Stephen Strasburg. Johnson was asked by veteran Washington Post columnist Tom Boswell about looking ahead to a schedule that “evens out” in the second half of the season, as the Nats have played more teams with winning records in the first half. Johnson started his answer by saying he takes things series by series, but then went on to say that he has looked ahead, contemplating a pennant race without his ace. 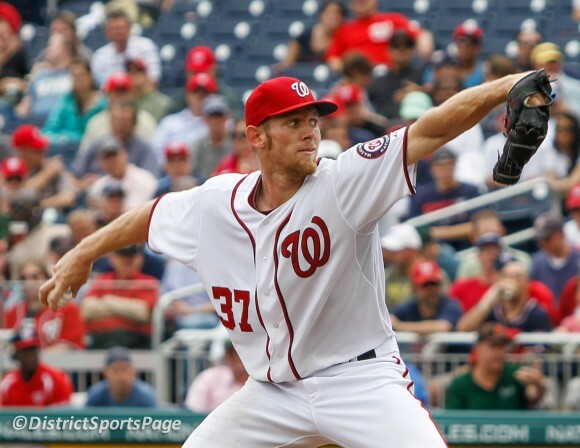 It’s been no secret throughout baseball that the Nats have a plan with regards to how they’ll handle Strasburg in his first full season after Tommy John surgery. Last season, with Jordan Zimmermann, the Nats capped their recovering pitcher at 160 innings. GM Mike Rizzo has stated on numerous occasions that the organization has a plan, and will stick to it, but has to this point not revealed what that plan exactly would be. On Wednesday, Johnson let it slip that part of the plan would result in Strasburg not pitching in September. That coincides with the plan they took with Zimmermann, but having it articulated from the manager made it seem definite. There’s been plenty of speculation and opinionating from all across the media — from bloggers to national columnists — about what the Nats would (or should) do with Strasburg should the club still be involved in a pennant race that late in the season or actually make the playoffs. It seems that the manager of the club is already trying to decide which pitcher currently under the team’s control would match up best against the team’s opponents in September as a replacement for his ace. Couldn’t agree more. Strasburg is pitching & hitting like the second coming of Babe Ruth.